Built to rugged MILT28800C environmental specifications, these units can withstand transportation shock and vibration to a remote slte. Or they can simply be moved from the engineering lab to the production floor with complete confidence in measurement accuracy. A wide array of price/performance alternatives are available. 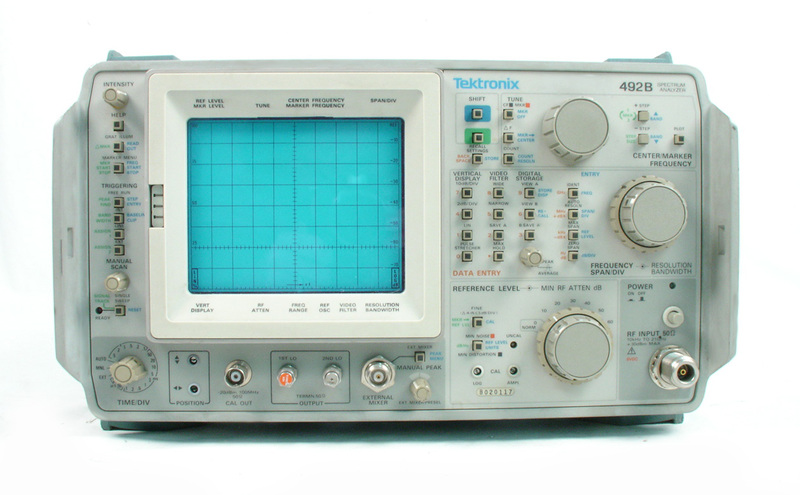 If you need 10 Hz resolution for an exacting close-in spectral purity measurement, consider the 494AP For more routine uses, such as a microwave transmitter occupied-bandwidth measurement, the 492PGM may be the most cost-effective solution. Downloadable programming (macro) capability lets you execute your frequently-used measurement routines from the Spectrum Analyzer's nonvolatile memory. In addition, these Spectrum Analyzers can store up to 10 complete front-panel measurement parameter setups in nonvolatile memory to save you measurement time. You can also save up to 9 waveform display; a real benefit when data analysis must be delayed. Tedious, time consuming, and often incorrect carrier-to-noise ratio calculations are eliminated; the instrument handles it all with a single keystroke, with automatic noise normalization to 1 Hz and automatic conversion for reference units such as dBm, dBmV, dBV, dB& and dB/Hz.